Doomed to forever roll a huge boulder up a steep hill, Sisyphus is a figure in Greek mythology who represents an impossible task. As his punishment in the Greek Underworld, each time Sisyphus neared the top of the hill, the boulder would miraculously roll itself down, forcing him to begin the task all over again. In other words, Sisyphus was punished to carry out this impossible task for all of eternity. But what did Sisyphus do to deserve this castigation? For you linguistic aficionados out there, you may be interested to know that it is from this mythological figure that the word ‘Sisyphean’ (used to describe a task that can never be completed) is derived. 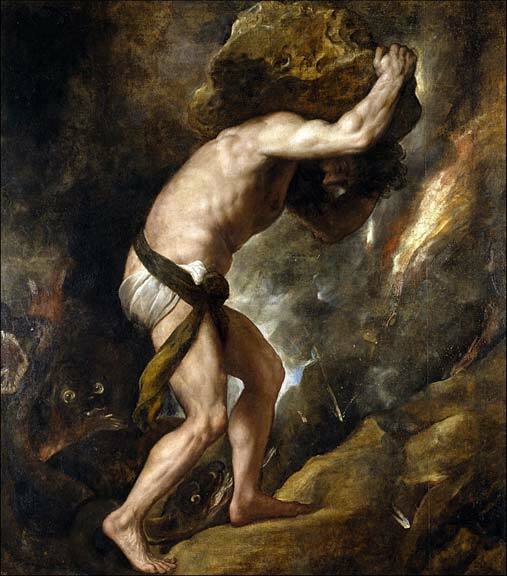 According to Greek mythology, Sisyphus was the founder and the first king of Ephyra (which is said to have been the original name of Corinth). He was the son of Aeolus, a king of Thessaly, and Enarete. Sisyphus is best known for being an extremely cunning person. In some later literary sources (i.e. after the epics of Homer), Sisyphus is regarded to be the father of Odysseus (whose father is traditionally said to be Laërtes), another figure in Greek mythology renowned for his cunning, through his seduction of Anticlea. Sisyphus apparently came to the attention of the gods when he broke xenia, which is the concept of hospitality and generosity that hosts are obliged to show to guests and travelers. In order to demonstrate that he was a ruthless king, Sisyphus had his guests killed on numerous occasions, thus violating xenia. This displeased Zeus, who was in charge of maintaining xenia. Nevertheless, Zeus only decided to take action against Sisyphus following a separate incident. The king of the gods had abducted Aegina, the daughter of Asopus, a river god who was the son of Poseidon. Sisyphus promised to reveal to Asopus what had happened to his daughter, on the condition that an eternal spring for his city was created. Thus, Zeus’ action was revealed. Incensed by Sisyphus’ deed, Zeus ordered Thanatos, the personification of Death, to bring him to the Underworld. When Thanatos came for Sisyphus, he asked him how his chains worked. As Thanatos was showing the king how the chains worked, Sisyphus swiftly trapped him in his own chains instead. As Death was now a prisoner of Sisyphus, no one could die. In the end, Ares, the god of war, had to intervene (wars were no longer “interesting” without anyone dying), and freed Thanatos. In another version of the myth, it was Hades who was sent to fetch Sisyphus, though he too was tricked by the king. Once released, Thanatos / Hades completed his mission. The cunning Sisyphus, however, was able to cheat death once more. Knowing that he would not be able to keep Thanatos / Hades prisoner for long, he gave certain instructions to his wife, Merope, which were to be carried out when he had been taken to the Underworld. Instead of giving him a proper burial, Sisyphus told Merope to leave his corpse unburied, and to forgo the necessary funerary rites. Once he was in the Underworld, Sisyphus approached Persephone, and complained to her about what his wife had done to his body. He requested to be sent back to the realm of the living so that he could punish his wife. This request was granted, and Sisyphus returned to the mortal realm. He went on to live to a ripe old age. In another version, Sisyphus scolded his wife for her negligence. As he refused to return to the Underworld, however, he was dragged back there by Hermes. Once in the Underworld, Zeus could have his vengeance on Sisyphus. To punish Sisyphus, and to dissuade other men from thinking that they too could make fools out of the gods, Zeus inflicted a rather bizarre punishment on the dead king. Sisyphus was made to roll a large boulder up a steep hill. Each time Sisyphus is close to completing his task, however, the rock magically rolls down on its own, and he had to start all over again, making it impossible for him to be freed from this punishment. The gods have had the last laugh indeed.